While completing my next tutorial about media trans-coding with free software, I would like to share with you two great things that happened in the world of freedom, in term of art and creative tools, lately. This first one is an exiting one and is about the release of Kdenlive 16.08. I often hear people saying that there is no good free, libre video editing software. Well it was also my opinion a few months ago but I don’t agree with this anymore. 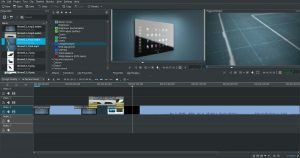 Kdenlive was already a very capable and solid video editor a few versions ago and, with this version, it is starting to be a very serious option for professional quality work. Kdenlive is actively developed and the team of contributors manages to release 3 new versions a year. On each of them, they do a lot of bug fixing and a few amazing new features. This new version adds a couple of very useful features like live preview rendering as a background job. I wish to say a big thank you to the Kdenlive team for their achievement! I will come back to Kdenlive usage in future posts anyway, so stay tuned! Working on Kdenlive with the power and comfort of a Librem is a real pleasure! The Librem is as fast as those free software are lightweight comparing to their proprietary alternatives. I don’t miss my old proprietary workflow at all. To be honest, I never had such a comfortable and fast user experience. Check out my “Studio Libre”! It is where all the film and animation’s magic happens. It features the Librem 13, running PureOS 2.1 on an super fast M.2 SSD drive with some of my daily applications (Kdenlive, Blender, MyPaint). Who said that in order to get freedom, you would have to sacrifice hardware speed and comfort ? Note that the Cintiq tablet is plugged into my old computer (also running PureOS 2.1). 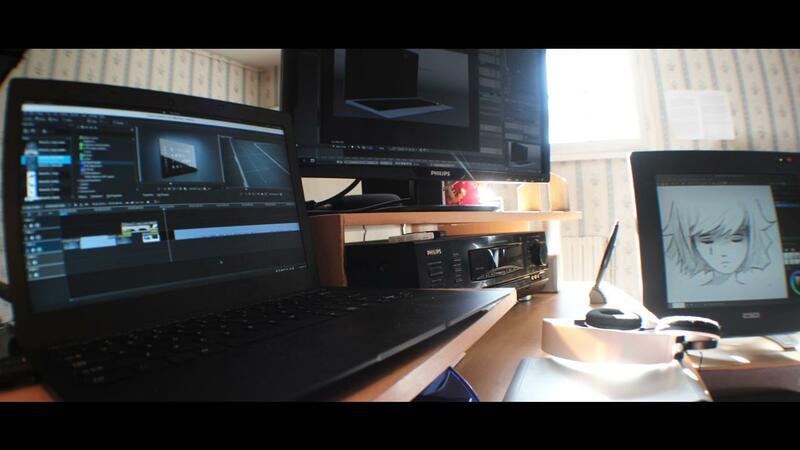 I use it for animations and drawing clean-up. This heavy setup is to be replaced by a more powerful, libre and lightweight Librem 11.
Pepper & Carrot goes animated! The second one is about a crowd-funding campaign to make an animated version of the web comic “Pepper & Carrot”. As an animator myself, I have been delighted by this news. 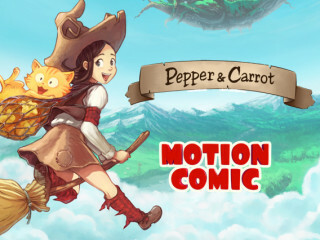 If you still don’t know Pepper & Carrot, you may check this website. It is a web comic, by French independent artist David Revoy, telling the story of a young witch (Pepper) and her cat (Carrot) in a fantasy world made of potions, magic and funny creatures. David Revoy, uses only free software (mostly Krita) to create this comic and releases it under a CC-BY license. The animated version would be made by Russian independent animator Nikolai Mamashev, also using only free software and releasing it under a copyleft license (CC-BY-SA). Both artists are very talented and know what they do. I think that the success of this crowd-funding campaign is very important for the popularity of our philosophy of freedom as the web comic is starting to get a lot of attention (even from big comics publishers) and this animated version would get its public straight away. It would give a lot of credibility and popularity to free art, free tools and of course, it would show that success is possible with doing things the ethical way. So if you wish to contribute or spread the word, here is the crowd-funding page. I wish to add that this post has been written from my own initiative as a supporter of libre art and neither Purism nor myself are technically or financially involved in these projects. My only point here, is that the existence of very capable and professional free, libre creative tools helps the development of libre art creations by attracting more artists. In return, this great art helps making the tools as well as our philosophy of freedom more popular. This is a virtuous circle in which we already stand. It is, in my opinion, an unstoppable and an exponential movement as the more popularity it gets, the more beautiful and enjoyable it is for everyone. This movement is very slowly (soon much faster) changing our world for the benefit of the people’s interest. One little free licensed creation at a time. Here at purism we wish to contribute to this ethical world by building modern and powerful computers that are focused on their users freedom only. In the world of freedom, competition is not discriminating and, as everything is made for the public interest, the success of one project is the success of everyone.